Empyrea, an island in the Andromeda galaxy belonging to planet Vathura is serene. Everywhere your eyes turn, you will feast on the lovely birds singing their heart out in the lush green vegetation. Osiris Mysterio ruled the regions of Empyrea with his brother Tyrant Seth and with their children Pitheceus Babi, Kraity Wadjet, and Horus Mysterio. 5000 years ago, the ancient Egyptians were the only humans to receive the invitation to enter Empyrea. They gladly on-boarded into a Pegasus chariot and took their journey to Empyrea. Their journey is indescribable. Empyrea by itself was like a fairy-tale garden, an ocean of flowers and exotic trees. As the Egyptians went further inside Empyrea, they saw its netherworld. They had mixed feelings when they saw the triangle shaped tombs and the bizarre headhunting people. 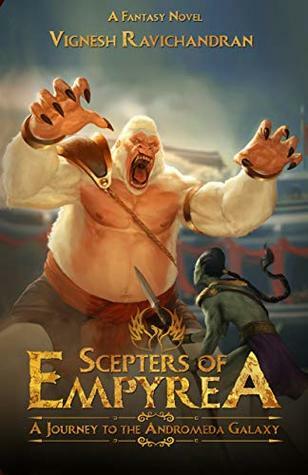 Empyrea also had the blood-curdling creatures like the deadly dinosaurs, gigantic snakes, furious apes, ruthless rhino’s, massive mastodons and many other creepy creatures. This showed the power of the Empyrean Army and that no other army could survive their wrath. The Emperor Osiris and the kings ruled Empyrea with powerful Scepters. With those powers, they were not only considered as kings but also worshipped as Lords. The Lords with the help of their scepter had the crucial power to transform themselves into giant creatures. Egyptians while departing from Empyrea was gifted with a shortcut portal to earth and also with some people and creatures of Empyrea to build the Empramids in Egypt. Overwhelmed with happiness they took the shortcut door and returned to Egypt. However, the happiness was short-lived in Empyrea. The Empire of Empyrea was betrayed for ruling earth avariciously. Somehow the Emperor of Empyrea locked the shortcut portal and asked the Egyptians to safeguard it. The Egyptians, on the other hand, failed to safeguard the portal. And some gangsters accidentally opened the shortcut door in 2017 A.D, entered Empyrea, and inadvertently got access to the Lord scepters. So, now the Earthians were left with no choice but to battle against the merciless predators and headhunting people in their heroic journey. Their ultimate fate lied in an empire beyond imagination. They would take their stand against the powerful lords, who brutally led their people to war against planet Earth. Did the gangsters protect the earth from danger, or left the other world to accomplish their tyrant rule on Earth? Explore the world of Empyrea to unravel the truth behind this mystery. Ekmali with harder effects climbed the edge and ran all over the terrace for finding kalishka, but she couldn’t see any foot prints of it. At last, she saw a blood filled mammoth tusk with a shell ornament on it. She picks it and closes her eyes, and a lovely visual comes into her mind, a naughty little girl playing alongside in the seashore and picking the shells from the sand, sudden water showers on her, but it’s not the rain, it came from the trunk of a kid mammoth with lush brown colored hair. The girl ran towards the kid mammoth and tying the shell ornament. Ekmali opened her eyes, and the tears automatically poured out of her eyes, she noticed kalishka’s bones rolling down on the floor with its blood. She wiped the tears from her face, took the shell ornament and wore it like a bracelet and lifted the tusks of the mammoth, tied at her two hands from her elbow. The sharp tusks are scratching down in the ground and leaving fire sparks in her fierce footsteps. She was ready to take on the foe army with the extra long tusks of her kid, she lunged like a saber and nailed the sharp tusks into the bodies of Dinomens and quetzals in a humongous force. First, a gigantic snake of 18feet in length was released into the arena, I had never seen a snake of that size before. It was a greenish ehill (hill) snake, the body was slender, tapering and slightly compressed, the dorsal scales overlapping strongly keeled apical pits, it had a gaping mouth with a long tongue that brought the fear of death. The contestants found it extremely difficult to attack it. The snake didn’t hurt the Nagas, but hits others with its tail and swallowed the weaker contestants. One of the vathroo spun his giant iron ball and tried hitting the snake. He released the iron ball in a blazing speed, it shot out like a meteor but just hit the dorsal scales of the snake. It swirled so fast and thrashed the vathroo with its tail, he was thrown to the other side of the arena. Meanwhile, a dinomen raised his axe and tried slicing the tail of the snake but it swirled and attacked the dinomen. When the snake was busy attacking the dinomen, an empyrean came rushing towards the snake, took the help from another vathroo by stepping on his launching iron ball and lunged behind the snake, shouted aloud and swung his sword towards its neck but the snake was too quick for him, it twisted and turned suddenly. The sword of the empyrean managed to scratch its left eye and .giving it a mark but before the blood drops oozed out from the scratch, the snake swallowed the 8feet Empyrean. Every contestant was hurling their weapons at it, but it easily escaped everyone’s attempt to kill it. There was only a little time left for the entry of the next animal, before that the contestants had to kill or lock the snake. Otherwise, they had to compete with two creatures at a time. The Rhinorio threw his trident on the hood of the snake and angered it and soon the snake was diverted and started to follow him leaving others behind. It twisted and swirled to catch him, the snake’s tail thrashed, narrowly missing the rhinorio, and before he could blink his eyes, it turned towards him, and their eyes were locked and were looking face to face. It spread its orange color hood and let out his enormous tongue and licked the horn on the Rhinorio’s head, later stretched its mouth wide enough to swallow the Rhinorio entirely. Seizing the moment, Prince Horus lunged and sliced the snake into pieces, but that was a just fraction of seconds before the entry of next creature. Vignesh Ravichandran is the author of the book Scepters Of Empyrea: A Journey to the Andromeda Galaxy. He did his Masters in Business Administration from a leading Business School and presently working as a Human Resource professional in a leading software organization in Chennai. He wrote this debut novel with the story line which he experienced in his nightmare 7 years ago.